It wasn't that long ago that if a horse broke a leg, euthanasia was the only course of action. Breaks are most commonly heard of in racehorses, but any horse can break a bone in its leg. While euthanasia is often still the only option, advances in veterinary technologies and techniques mean some horses can be saved, and may even be able to return to their work in some capacity. But saving every horse with a fracture is still a long way off. Here's why. If a human breaks a leg, the worst-case scenario is surgery to place pins to hold the bones, a cast and weeks or months of allowing the bone to heal followed by physiotherapy. Our bodies are relatively light compared to a horse's and our leg bones are larger in ratio to a horse's. We also know that we must stay off of the injured leg so that the fracture mends properly without stressing or damaging the healing bone. Most people, no matter how complicated their fracture, will probably survive their fracture unless there is some sort of unusual complication. Unlike humans, horses have heavy bodies and light leg bones. This is the way we've developed many breeds, especially Thoroughbreds. When bones break, it often means they shatter. And it's almost impossible to surgically reconstruct the fractured leg. 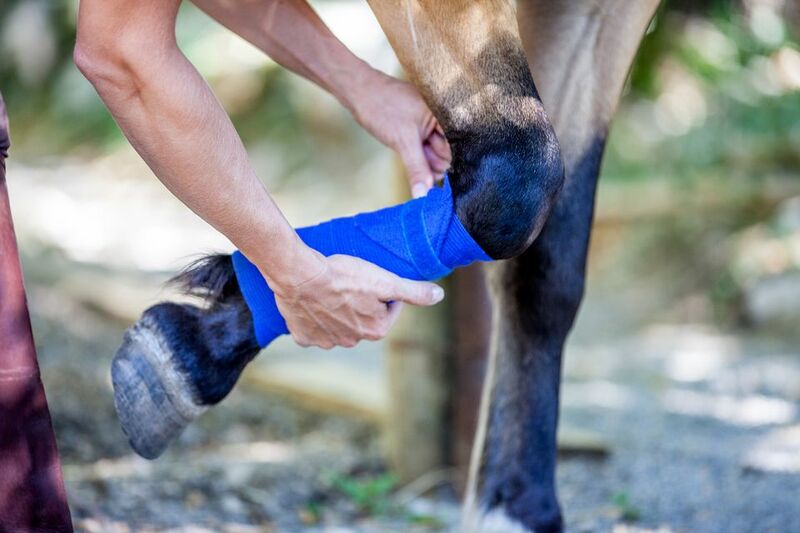 While humans have some large muscles and a bit of tissue below the knee that helps stabilize a broken bone, along with a cast, a horse has no muscle or any other tissue besides tendons and ligaments below the knee. The lack of muscle and other tissue means, even with a cast, the broken bone has little to support it. And, it's much harder to prevent a horse from using its broken leg to bear weight. Horses stand most of the time, and a horse is likely to instinctively flee when it's startled, instead of reasoning that it must keep weight off of its fractured leg. This makes the chances of re-injury high. Horses put a huge amount of stress on their legs, especially when galloping and jumping. And, there are many fragile bones below the knee and hock. Some of the bones are within the hoof, and when they shatter, they are far more difficult to stabilize and let heal. Over half of the horse's weight is borne on the front legs, so those bones and joints, in particular, take a lot of abuse. Even if a horse's bones are healing, other complications can set in, such as static laminitis, making it difficult for the horse to fully recover without ongoing severe pain. The less complicated the fracture, the more likely the horse will recover. Greenstick and stress fractures are incomplete fractures, and these can be treated successfully. Simple fractures, where there is one clean break, are more likely to heal successfully than shattered bones. Compound fractures, where a broken bone penetrates through the skin, are less likely to repair, and in many cases result in euthanasia. Fractures that involve the joints such as pasterns are often irreparable. Fractures that happen above the knee are also difficult to repair. A horse that has fractured a leg will be in obvious distress. It will not want to bear weight on the leg and there will be swelling. The leg can hang crookedly, or a bone may appear to be coming through the skin. As soon as possible, have a veterinarian examine the horse. Further movement can mean the horse can cause additional injury to itself, so it must be kept as still as possible. If the veterinarian determines the fracture can be repaired, the horse may be transported to a veterinary hospital.